Casey Buck is an ardent performer and music educator. He earned Bachelor of Music Education and Master of Music in Performance degrees from Loyola University New Orleans, where he studied cello with Allen Nisbet. 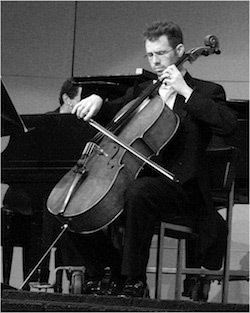 As a cellist, Mr. Buck is now in his seventh season with the Arkansas Symphony Orchestra. He has also had the opportunity to play in masterclasses for cellists Lynn Harrell and Maria Kliegel, and has given solo and chamber music recitals both in Louisiana and in Arkansas. As a music educator, Mr. Buck’s commitments are broad and diverse. Mr. Buck’s main teaching engagement is with the Conway Public Schools orchestra program. In addition to directing the ASYO Preparatory Orchestra, he also maintains a private cello studio in Conway, and has served as a clinician for several local summer orchestra camps as well. He was a Visiting Lecturer of Music at Arkansas Tech University for six years, where he taught String Methods and Applied Strings. Additionally, he serves on the Board of Directors of the Arkansas Center for Music Education (ACME), a non-profit music education outreach to home-school, private, and public school students in the Russellville area. Mr. Buck resides in Conway with his wife, Kristina Rose Buck (a classically-trained mezzo-soprano), their daughter Abigail Rose, and their dog, a West Highland White Terrier named Brady.